What I find is basically a flame war (not the worst one I’ve seen but one nonetheless) and someone has posted a link to my blog right in the middle of it! A character named Drotara…wait a minute, I know that name. A few seconds later, I figure it out…you! I’m surprised by the whole thing. Not mad or anything, just surprised and a little flattered. After all, I’m not the only hunter blog out there yet he only mentions me. So I get this idea…an idea for a reciprocal surprise …Operation Scilohotep. I know which server Drotara is on and that he plays a male orc hunter. 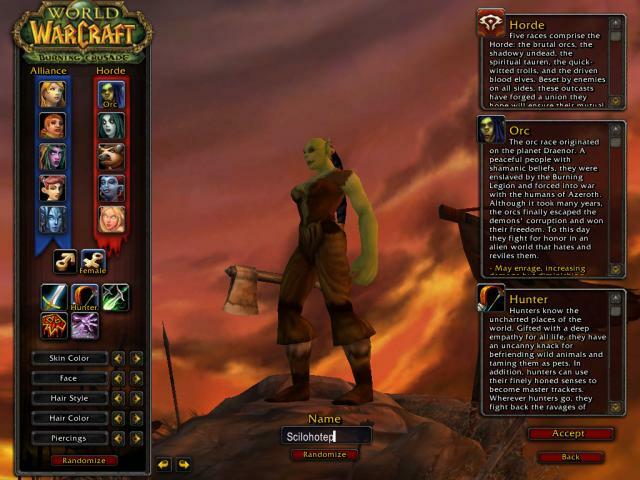 So I create an complimentary female orc hunter named Scilohotep. Nothing fancy, just something to get the job done. I log on with her and…Drotara’s in Karazhan. I may not raid but I do know that that’s a dungeon so he’s probably busy. I won’t disturb him now. Unfortunately I have to go to bed so the next phase will have to wait. 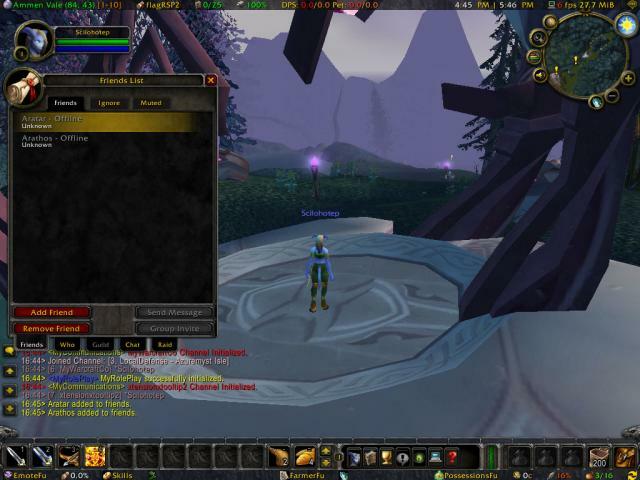 The next day, I log onto the young orc hunter, only to discover that Drotara’s not online. 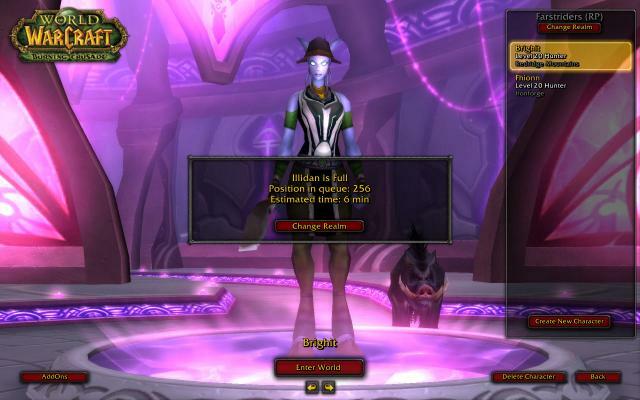 This time, there’s a nice queue waiting for me as I try to connect to Drotara’s server. Oh, it says 6 minutes on the screenshot but it took more like 13 minutes. I’m patiently wait through it but I’m glad that this isn’t my normal server. Scilohotep: Funny thing is, you’ll probably know me. See if you can guess it from my name. Scilohotep: I’ll give you a hint…read it backwards. Scilohotep: LOL, right on the dot, man! Drotara: Yeah, some of those people. Can’t wrap their head around things that might be fun. Scilohotep: Just out of curiousity, why did you post my blog of all the ones you could have chosen…like your own? Drotara: Your welcome. I enjoy reading your blog a lot. Drotara: You too! Thanks for stopping by! Of course, he beat me to the punch on posting about this but that’s alright because I know I’m slow on these things. However, I found out that Sethekk Halls is actually a dungeon and that I interrupted him in the middle of it. I can be such a n00b sometimes. Sorry, man! Comments closed — Trackbacks closed RSS 2.0 feed for these comments This entry (permalink) was posted on Wednesday, January 30, 2008, at 12:00 am by Faeldray. Filed in Blogging, Musings, Random Thoughts and tagged Scilohotep. Heehee. Love the backwards name! Yeah, typing it backwards was about as inventive as I got :P. I just realized how many smileys we used in that conversation…13 total!